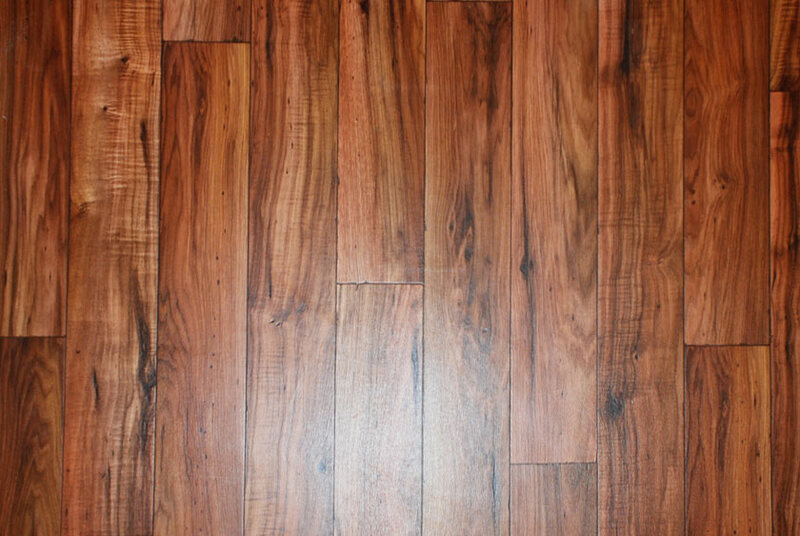 Wide planked faux maple hardwood flooring extends all through the restroom trailer. The interior's faux beige marble walls include detailed faux marble moldings and trim work. There is also egg and dart faux marble crown moldings throughout. The magnificent faux painted sky mural ceiling, which was very popular in the old world, epitomizes the opulence of the VERSAILLES design. 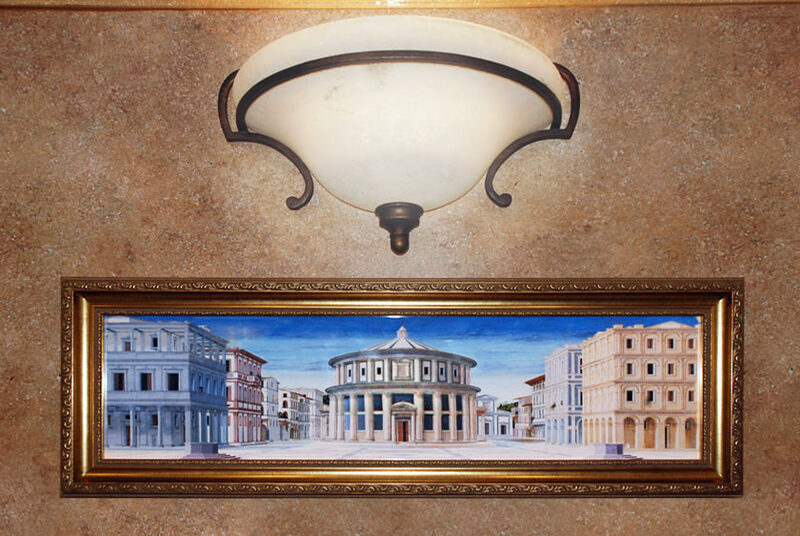 The light fixtures are wrought iron with white marble globes and the brass framed artwork adds to the French style ornamentation. 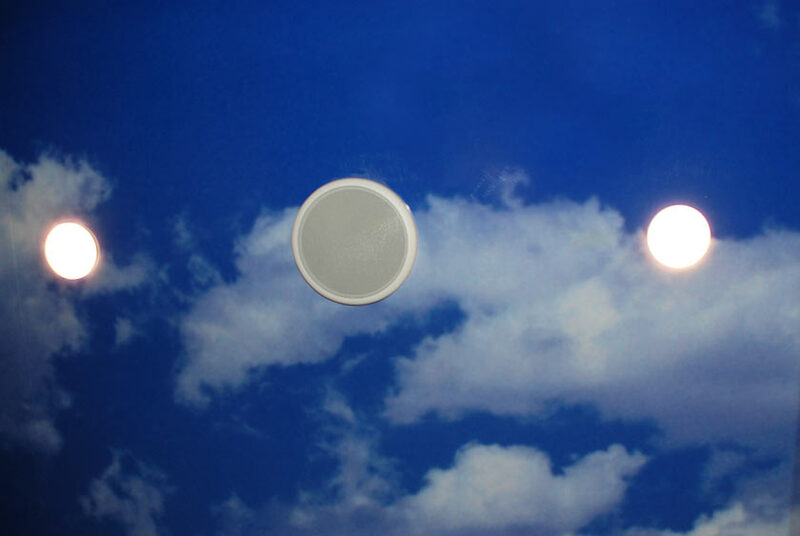 The vanity countertops are a white and gold Calcutta marble with two white porcelain vessel sink basins. 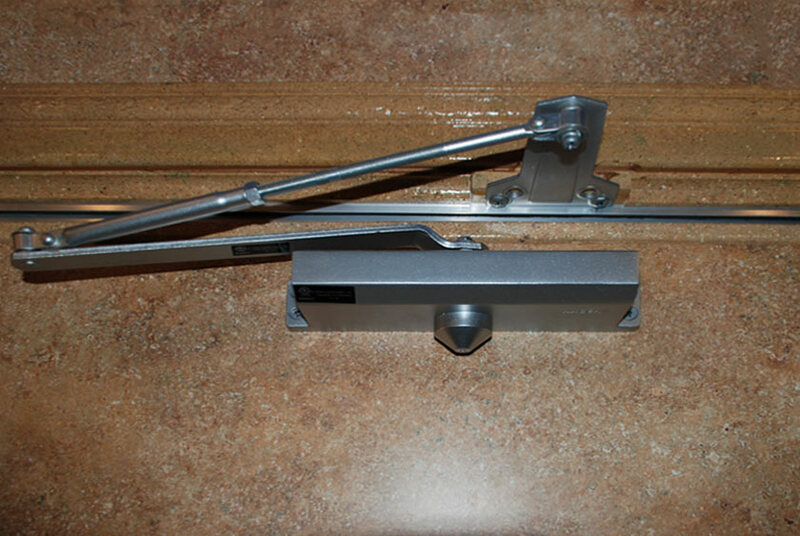 Chrome Moen faucets have automatic shut off, and provide both hot and cold running water options. 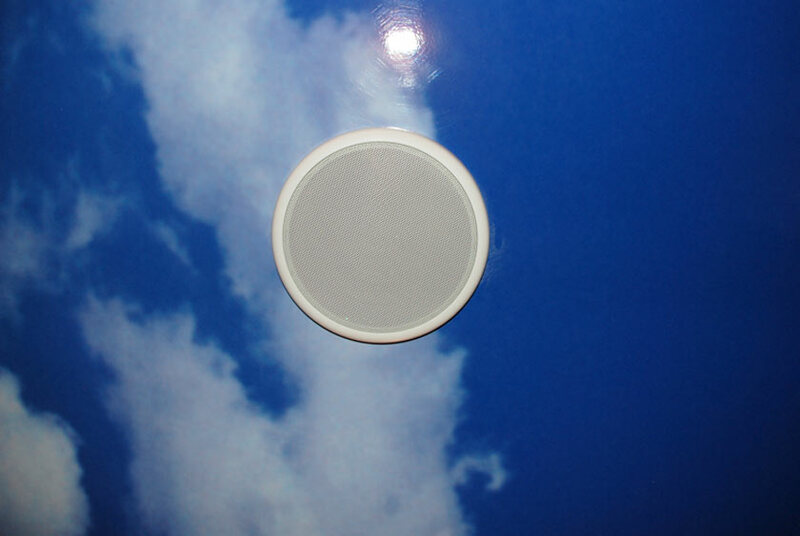 Designer antibacterial soap dispensers, hand towels, filled tissue holders and candy dishes are conveniently provided. 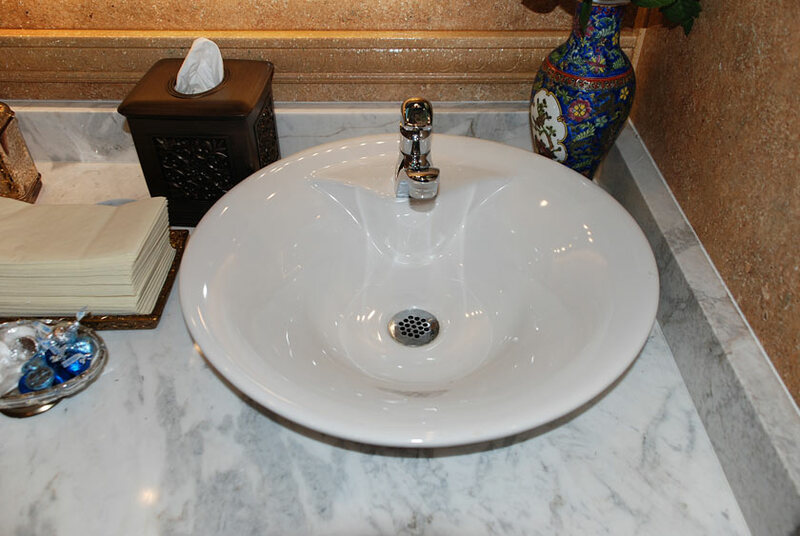 The vanity's built in trash receptacle drops the trash beneath the sink to keep the sink area clean. 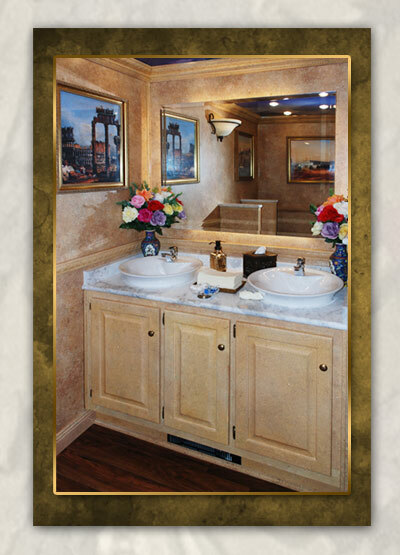 A full size vanity mirror above the sink has low voltage lighting while a full length mirror is also provided. 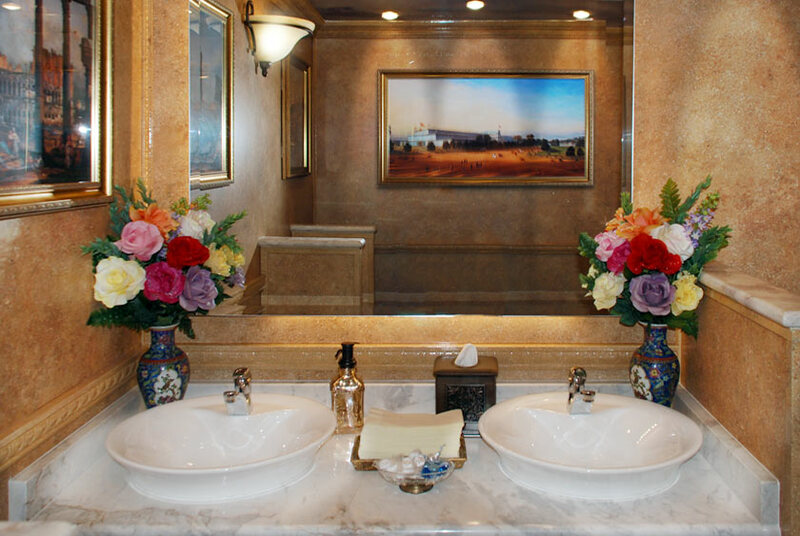 Lovely floral arrangements beautify the vanity area. The women's restroom has five large bathroom stalls with floor to ceiling dark mahogany wood doors. 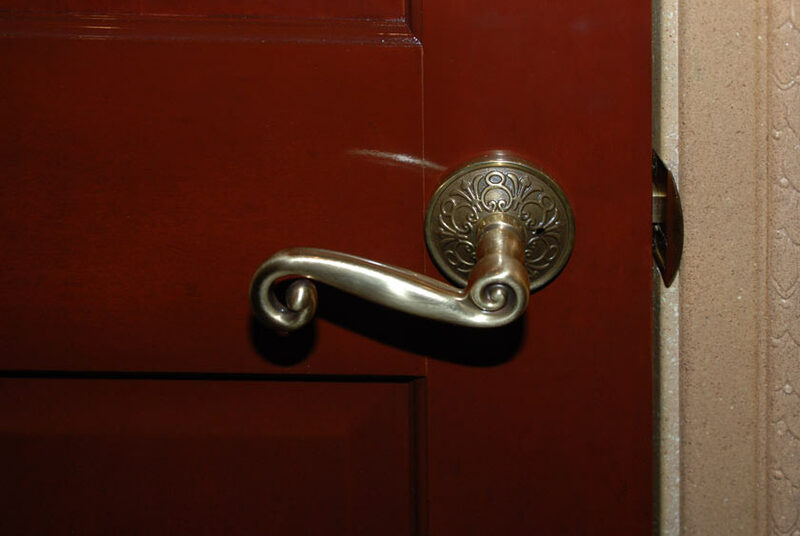 The door handles, hinges, locking system, coat and hat hook, and dual toilet paper holders are a rich antique brass finish. 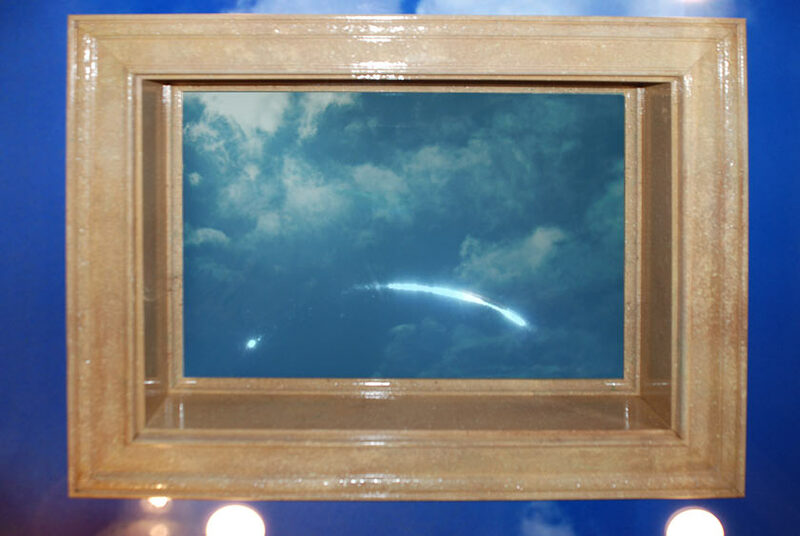 Framed art displays exquisitely in each bathroom stall. 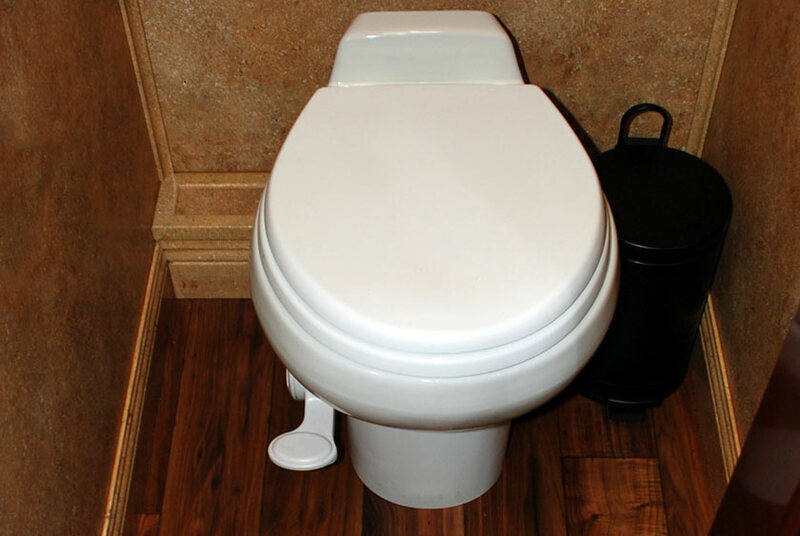 The white porcelain spring loaded toilet bowl operates with a pedal flush for hands free operation. Individual covered trash receptacles are also provided in each stall. The men's restroom has two private bathroom stalls with all the luxurios features and amenities as the women's restroom. The men's restroom has four porcelain urinals, each with privacy dividers, and operate completely odor free due to a special filter system. 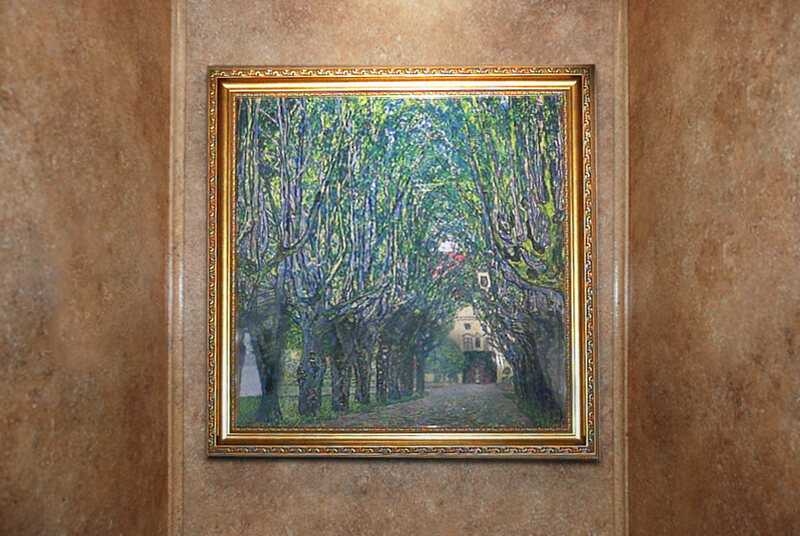 The ornate artwork throughout the restroom trailer was specifically selected and custom framed for the VERSAILLES. Artwork includes masterpieces in architecture, famous landscapes and glorified interiors enriching the restrooms lavish décor. 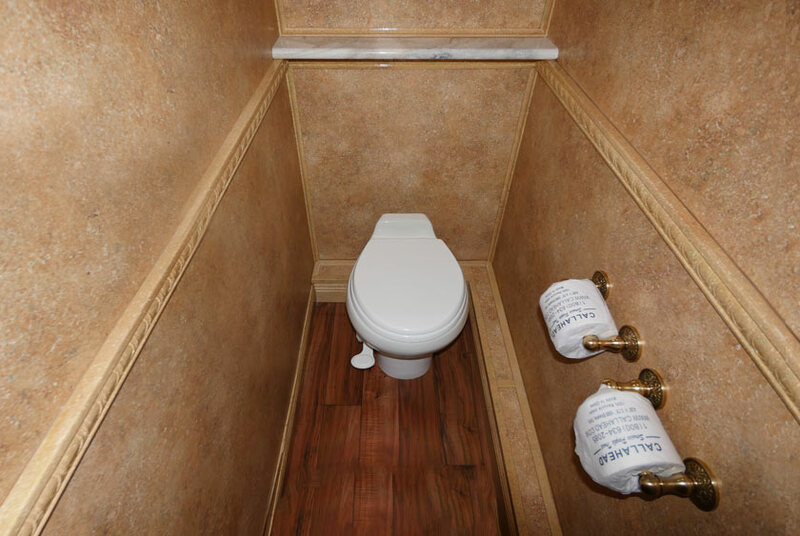 The VERSAILLES portable bathroom trailer can be rented any time of year. 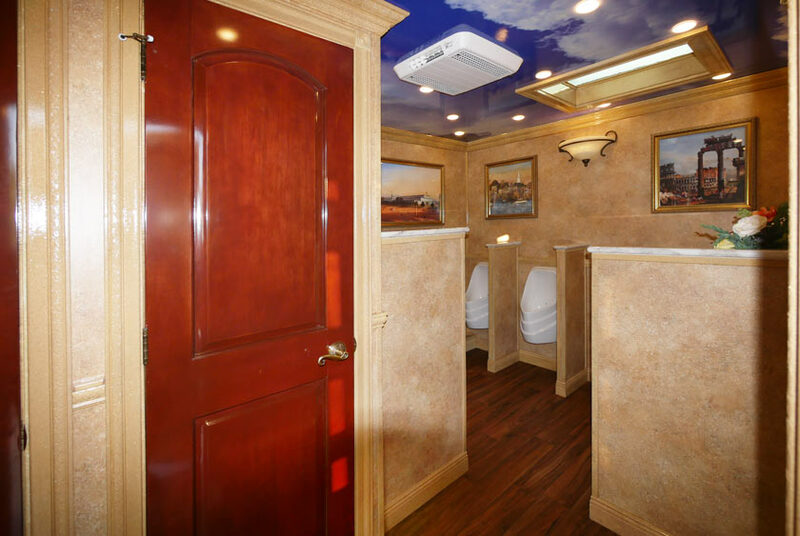 Equipped with a thermostat heating and cooling system, the restroom trailer will stay the ideal temperature all year round. Skylights supply plenty of natural light. 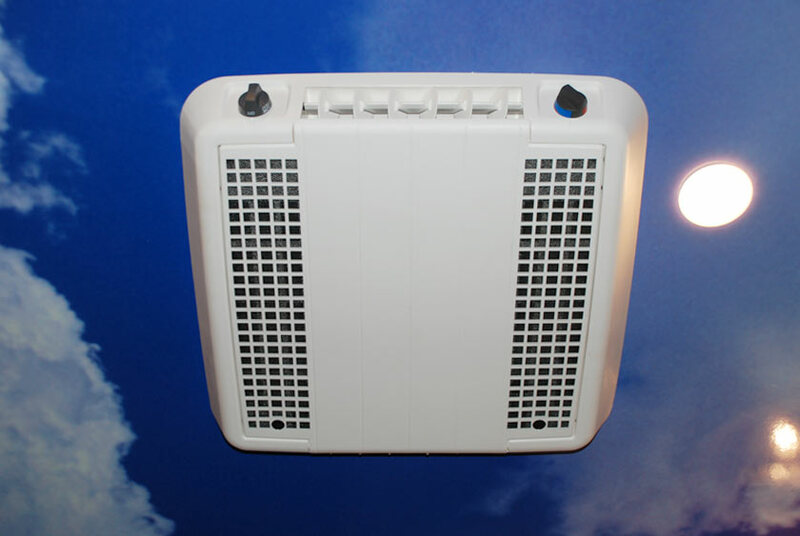 In addition, each bathroom stall has its own personal skylight, fan and ceiling vent if desired. 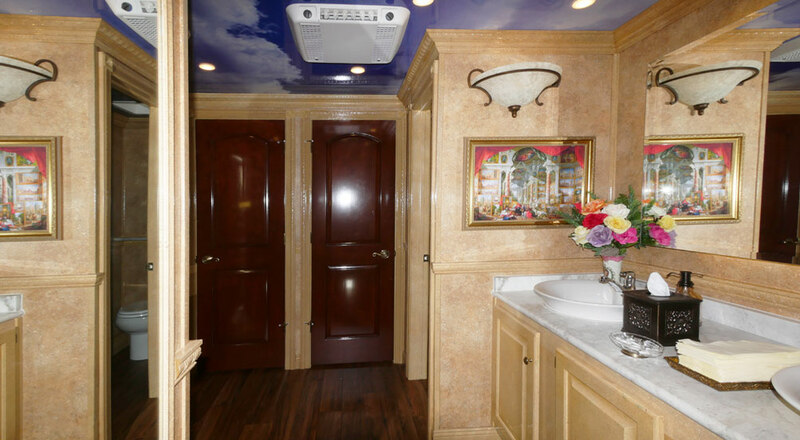 This luxury restroom trailer's electricity conveniently runs on a generator or standard 110 Volt outlets. It will take only about 30 minutes to set up the VERSAILLES to be fully operational. 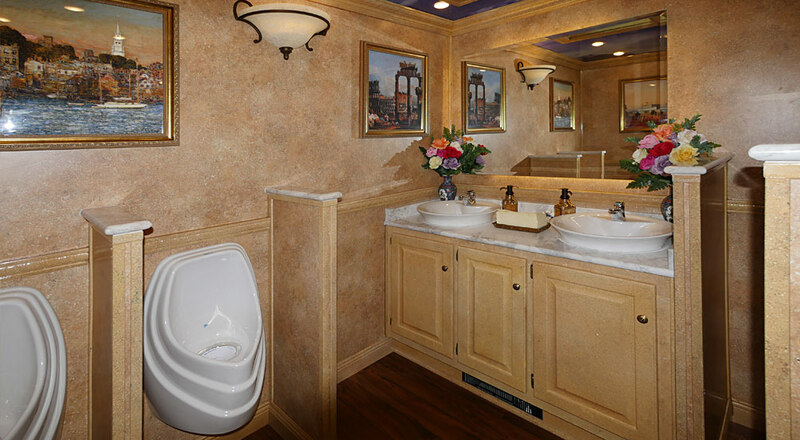 A CALLAHEAD professional uniformed delivery specialist will arrive to set up the VERSAILLES restroom trailer at the location you select. 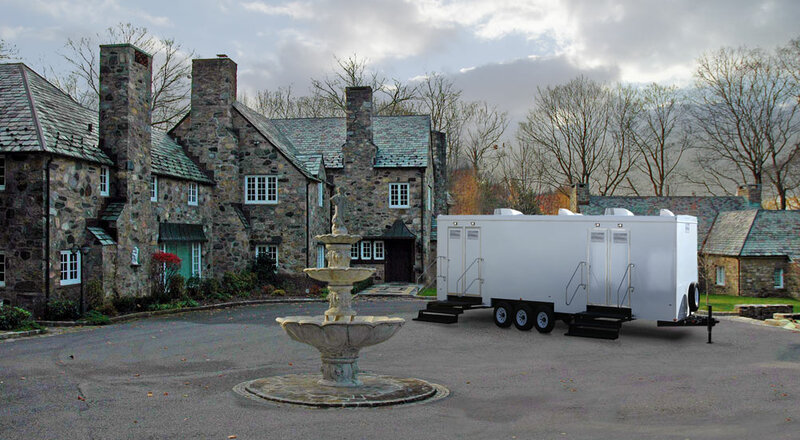 This is a completely self-contained portable restroom trailer with a separate fresh water and waste water holding tank to handle use by hundreds of people at your special event. 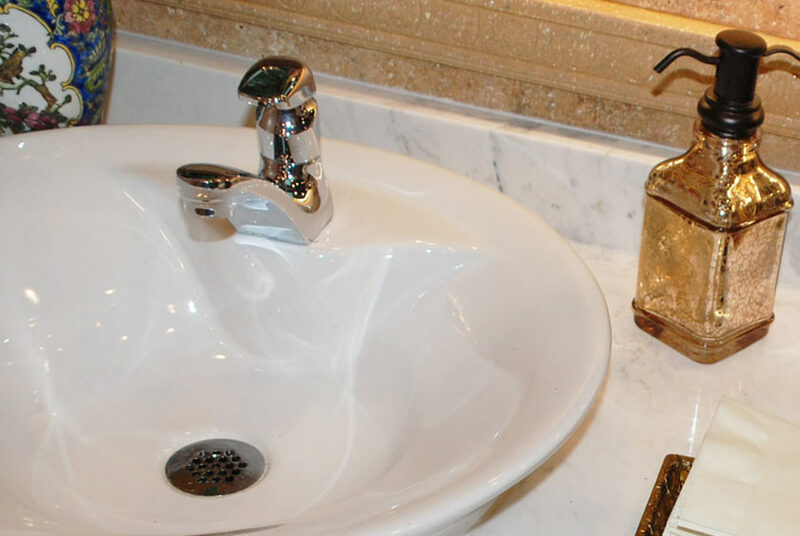 Because CALLAHEAD uses only hospital grade cleaners and disinfectants, you will be confident you are providing your guests with the utmost sanitary restroom facilities available. 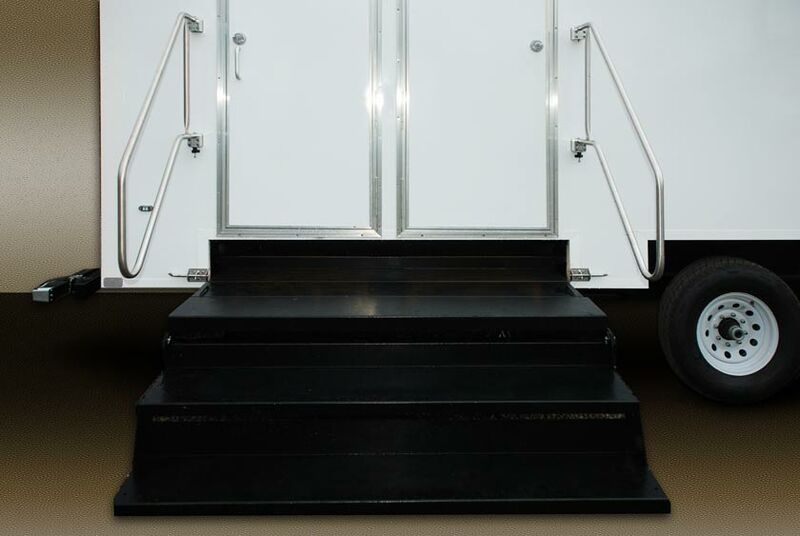 A CALLAHEAD professional uniformed restroom attendant is an additional option to ensure your VERSAILLES luxury restroom trailer stays perfectly clean and sanitary throughout your entire event. 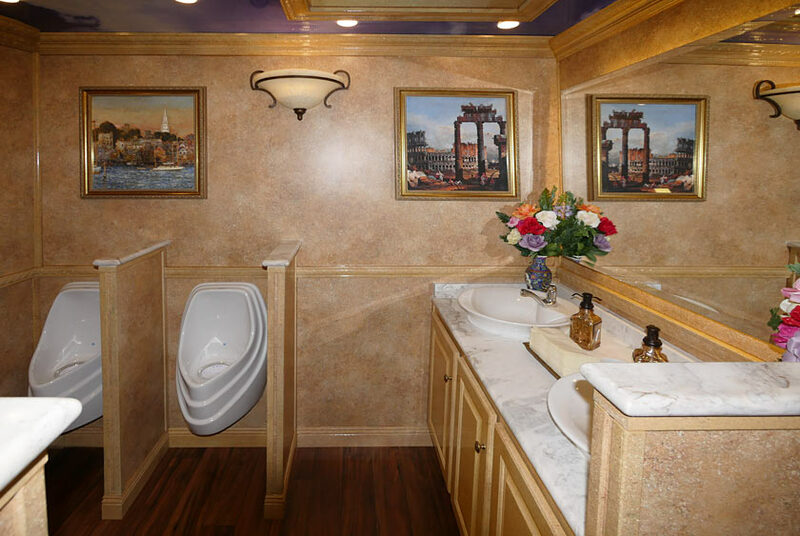 When you rent a CALLAHEAD luxury restroom you will know this is one necessity you won't have to worry about. 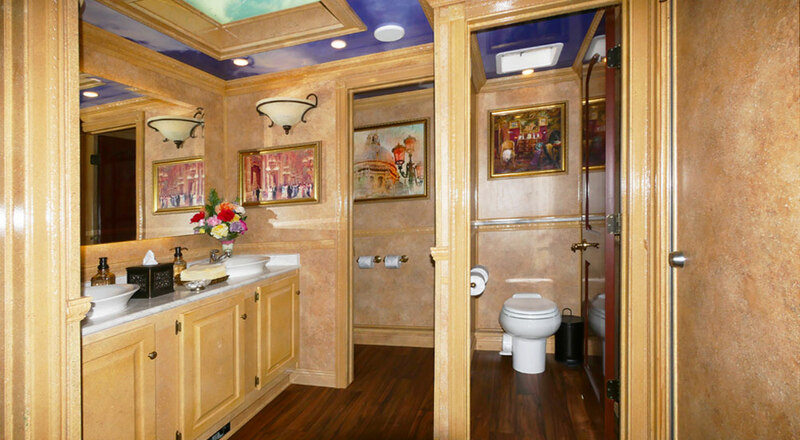 Mr. Howard's design of the VERSAILLES luxury restroom trailer in the grand French Louis XIV style is guaranteed to exceed all expectations and astonish even your most discriminating guests. 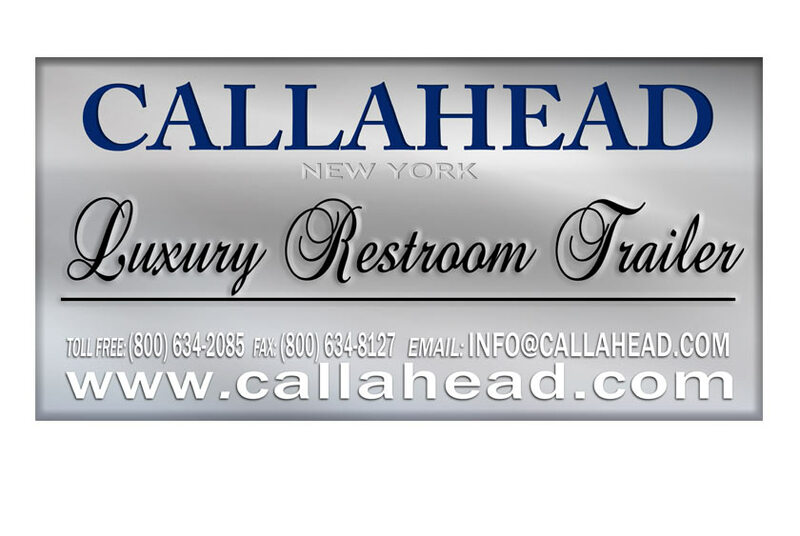 It is our relentless pursuit to continue to create the most luxurious and advanced portable restrooms in the world that sets CALLAHEAD apart from every other company in our industry. 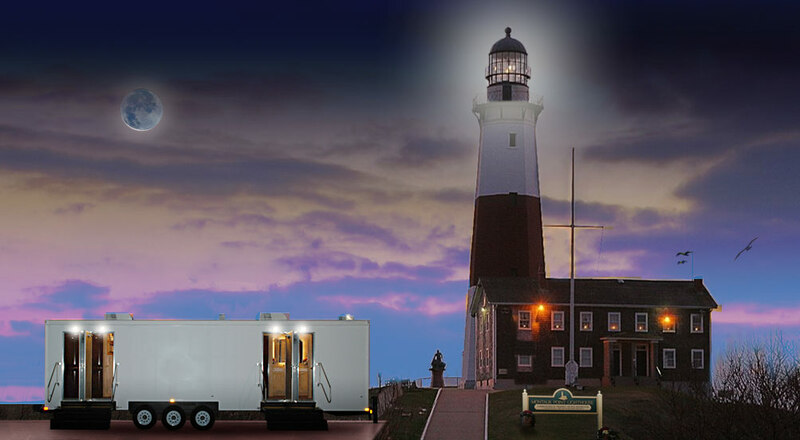 The VERSAILLES luxury restroom trailer is available for delivery throughout all of New York City's five boroughs of Brooklyn, Queens, Manhattan, Staten Island, and the Bronx as well as all of Westchester County, and Nassau and Suffolk Counties all the way to Montauk Point. 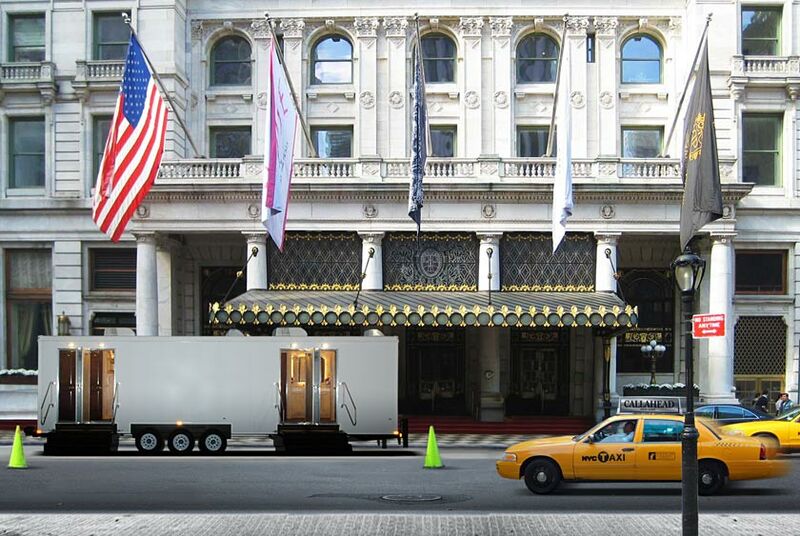 For more information about the VERSAILLES luxury portable bathroom trailer or any of CALLAHEAD's innovative equipment, including restroom trailers, VIP portable toilets, standard portable toilets, portable sinks, porcelain toilet systems for office trailers, guard sheds and ticket booth rentals, holding tanks, fresh water delivery, commercial portable sinks, portable hand washing sinks, antibacterial and hand sanitizing dispenser rentals, long-term or short-term portable toilet rentals, long-term or short-term restroom trailer rentals, portable shower rentals, and portable storage shed rentals please contact one of our expert sales specialists at 800-634-2085 or visit our website for full photos, details and videos of our equipment for all your portable sanitation needs at www.callahead.com. 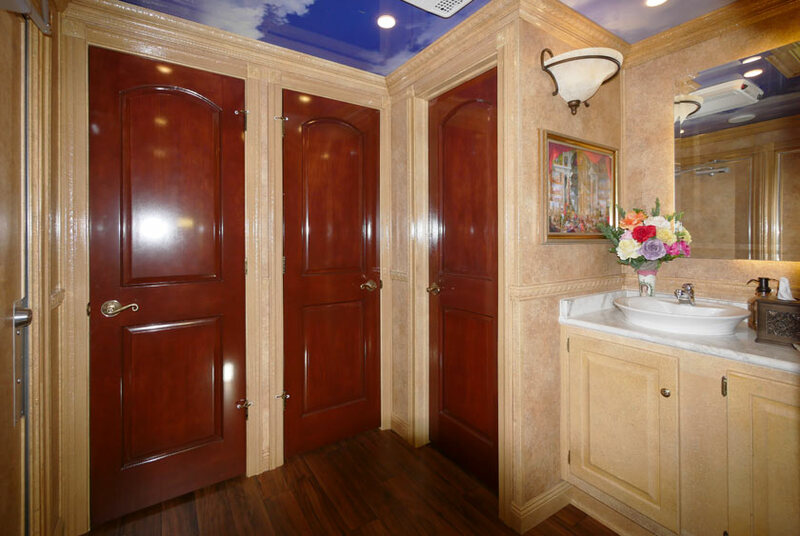 The VERSAILLES is a luxurious restroom trailer exclusively for CALLAHEAD by President and CEO, Charles W. Howard. The VERSAILLES was designed by Mr. Howard to transport your guests into the grandeur of the French Louis XIV style of its namesake, the Palace of Versailles in France. 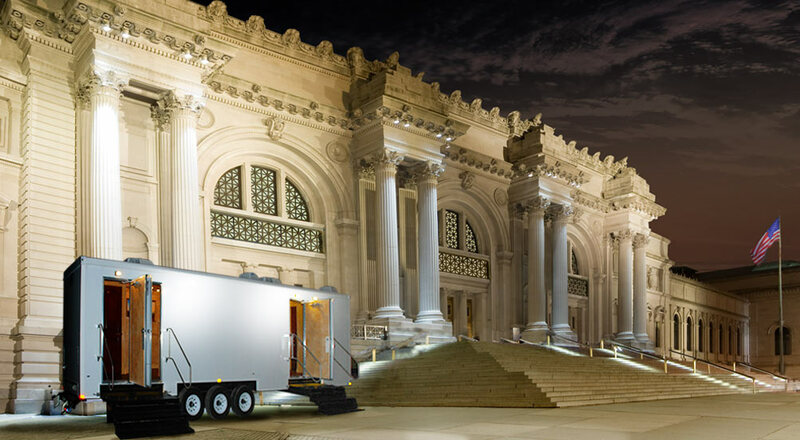 This is the ultimate restroom trailer for weddings, cocktail receptions, corporate events, or any formal celebration. 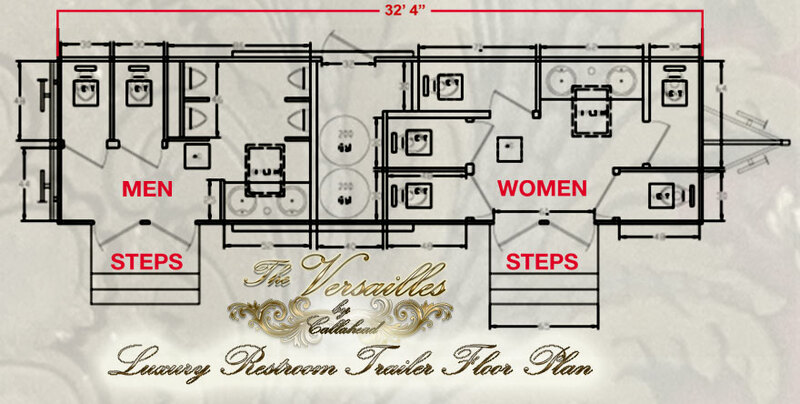 The VERSAILLES restroom trailer has the grand scale décor of the old world with all the luxury conveniences for your guests. 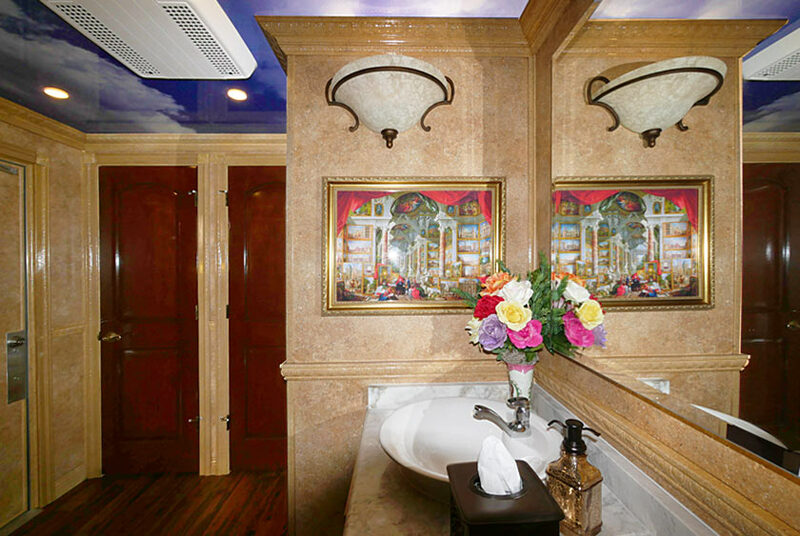 The women's and men's restrooms each have private bathroom stalls, elegant custom framed artwork, exquisite floral arrangements, thermostat heat and air conditioning, surround sound music system, porcelain vessel vanity sinks, full vanity mirrors, and designer antibacterial soap dispenser, hand towels, tissues and candy mint dishes provided. The women's restroom has five spacious bathroom stalls with floor to ceiling mahogany wood lockable doors. 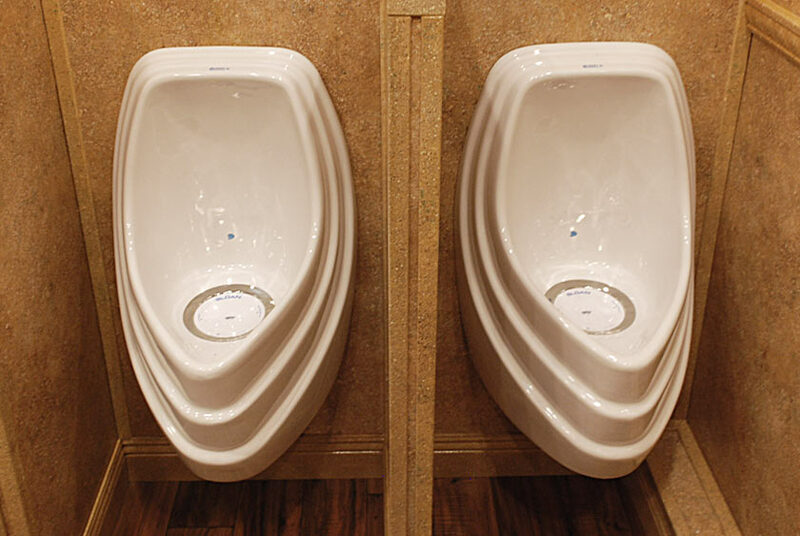 Just as plush as the women's with all the amenities and décor, the men's restroom has two large bathroom stalls in addition to four waterless and odorless porcelain urinals. 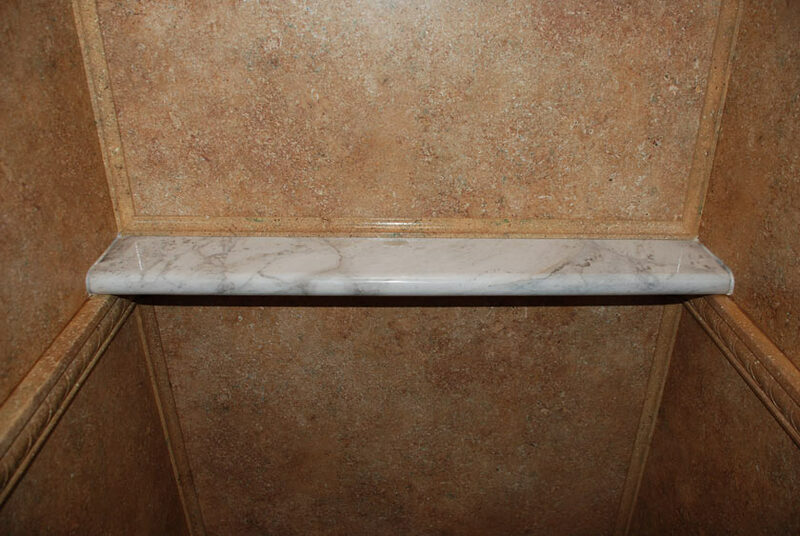 The urinals privacy dividers are a faux marble with beautiful Calcutta marble caps that enhances the details of the men's restroom area. The VERSAILLES' exterior is a bright white color with outdoor lighting. It looks incredible when lit up at night. Both the men's and women's restrooms are equipped with their own entrance and exit doors. 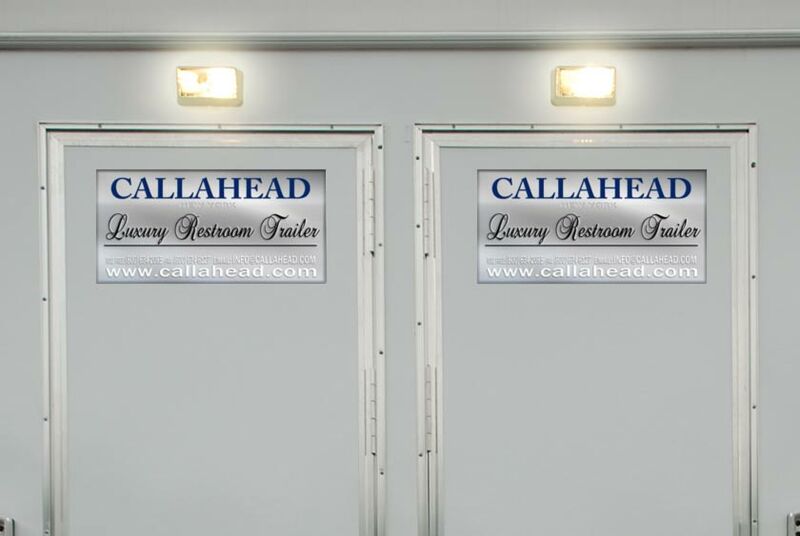 Each exterior door tastefully displays, "CALLAHEAD Luxury Restroom Trailers". 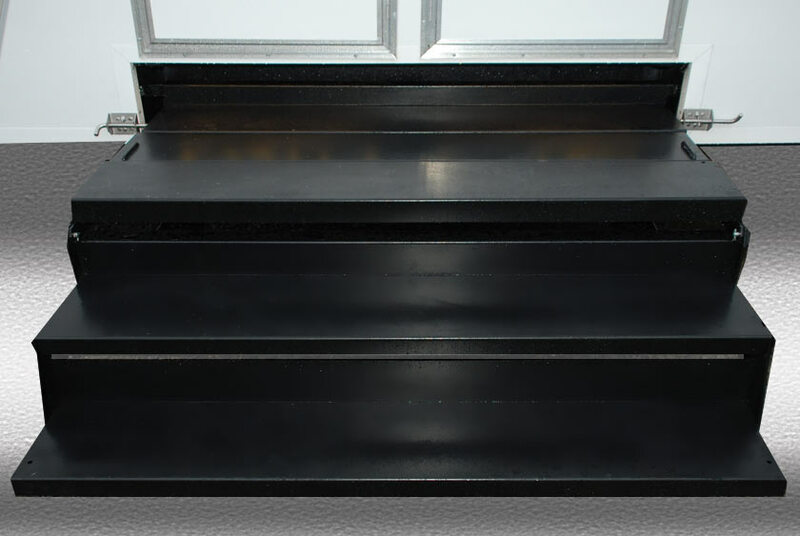 The sturdy wide floating staircases have stainless steel hand railings and non-slip surface for safety.